Summertime in the Bay Area has arrived and with it comes the first ever solo acoustic shows from Chris Robinson. 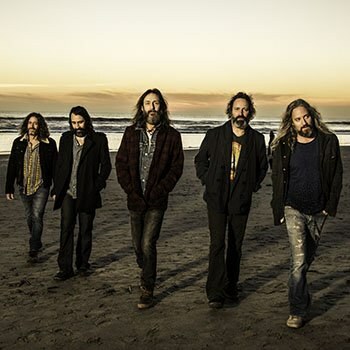 Launched to fame and some fortune with the Black Crowes in the early ‘90s, Robinson has put in serious work over the past six years to carve out another musical identity with “a grassroots, farm to table, psychedelic band mentality” in the Chris Robinson Brotherhood. The band has toured relentlessly and are set to drop their fifth studio album Barefoot in the Head this summer. Robinson has also been a semi-regular at Phil Lesh’s Terrapin Crossroads club across the Golden Gate Bridge in Marin County, where he also now resides. He plays occasional shows with Lesh and recently gave a trio of stellar performances at Terrapin with a new project dubbed Chris Robinson’s Hootenanny Heroes. This run saw Robinson deliver three completely different shows with three different band lineups, focusing on fun classic rock gems that influenced his development. The first show featured bluesy retro rock tunes like “Walking the Dog”, “Carol” and “Train Kept a Rolling” that conjured a most festive old time rock ‘n’ roll dance party. There was also a deep jam on “King Bee”, with Robinson blowing harp with a mojo that seemed to conjure the spirit of the legendary Ron “Pigpen” McKernan. The second show had a flavor more along the lines of the country flavored rock of the New Riders of the Purple Sage, with Barry Sless delivering the pedal steel guitar and a hot version of Charlie Pride’s “Is Anybody Going to San Antone” that grooved more like the Sir Douglas Quintet’s “Mendocino” with Terrapin Family Band guitarist Ross James sitting in on a raucous jam that had the Grate Room getting down. The third show had more of a ‘70s radio rock vibe with tunes like “Hey Hey What Can I Do”, “Magic Carpet Ride” and “Blues Power”. The show also included a bust out of the Black Crowes’ “Seeing Things” that suggested Robinson is ready to start owning some of those songs again. The trio of shows demonstrated what a diverse songbook Robinson can deal from, revealing one of modern music’s most authentic rock ‘n’ roll devotees. Some Black Crowes fans have become vocal critics of Robinson, pouncing on brother Rich Robinson’s declaration that Chris spurred the breakup of the band with an Axl Rose-type demand that bandmates cede financial stakes. But Chris has responded that the scenario was far more complicated than that, while understandably refusing to air all the dirty laundry in public. He’s also hinted at creative differences with his brother, such as in a December 2013 interview with Songfacts.com during the Crowes’ last tour when he commented on an instant classic in the CRB repertoire which he suggested wouldn’t have flown with the Black Crowes. “It's funny, because ‘Rosalee,’ it was Neal who said, ‘We have to make something out of this.’ Because I was like, ‘Well, it's happy.’ And the Black Crowes don't really play happy songs. So the CRB, we can play happy songs,” said Robinson of his songwriting process with bandmate Neal Casal on fan favorite jam vehicle “Rosalee”. If it’s true that Rich Robinson wouldn’t be interested in such a tune, it speaks volumes to how the Robinson Brothers were drifting apart creatively and spiritually. As does how some of the setlists on that last tour saw the band cranking out the same old greatest hits type shows when they have far more material worth exploring. It’s hard to believe that was Chris Robinson’s choice, and he has indeed built the CRB up in a grassroots way that enables the band to play whatever they want without fans clamoring for the hits because there are no hits. It’s worth noting that Anchor Steam’s “Brotherhood Steam” beer is available here at the Chapel, as it was in Terrapin’s Grate Room for the Hootenanny Heroes shows. This once again demonstrates Chris Robinson’s admirable devotion to ensuring his fans have good beer to drink (with the dry-hopped spin on the traditional Anchor Steam being a staple beverage at CRB shows where one never knows how venue beer selection might vary on tour.) The Chapel does, in fact, have a decent beer selection, though there’s still nothing else quite like quaffing Brotherhood Steam during a Chris Robinson show. This gets the evening’s services off to a vibrant start. He follows with a later era Crowes song in “Oh Josephine”, a heartbreak lament from the band’s underrated 2008 Warpaint album. But then the perils of putting oneself out there in a solo acoustic format in this day and age of the short attention span pops up, as the end of the song is quickly followed by the typical chatter that occurs at most music clubs these days. Robinson takes umbrage, chastising the crowd as he points out that it’s tough to concentrate on delivering this type of focused performance with that kind of background noise. The crowd settles down for the most part, although it’s not the last time of the evening something needs to be said about it. “Fork in the River” offers another obscure Crowes number from 2009’s Before the Frost… Until the Freeze double album that appears to be the band’s swan song. It’s filled with great tunes that could still be ripe for further exploration, as the audience’s positive reaction to this soul searching tune shows. “100 Days of Rain” dives into the CRB songbook for a deep cut that highlights Robinson’s background as a soulful Southern troubadour. He follows with a new song from the upcoming album and “Hark the Herald Hermit Speaks” is an instant winner. It’s a treat to hear the stripped down version and be able to easily imagine the sonic bells and whistles that will be applied when the CRB plays it as the psychedelic rocker it clearly will be. Where the more countrified “Blond Light of Morning” will fit into the CRB’s sonic landscape isn’t as readily apparent, but it’s interesting to hear new songs in this format and wonder how they’ll come out on the album. Robinson turns the clock back for a crowd pleasing gem with “Like a Tumbleweed in Eden” from his New Earth Mud project, a gorgeous tune that was also a big winner on his memorable fall 2005 tour as the vocalist for Phil Lesh & Friends. The acoustics of the Chapel bring out the extra sonic shimmer the song inherently possesses, making it a great selection on multiple levels. Throughout the set, Robinson’s trademark soulfully cathartic voice shines regardless of whether he’s singing a fan favorite or an obscure deep cut. He’s got plenty of both, a testament to what a prolific songwriter he is and how he’s grown from being one of the trailblazers of the modern jam rock scene in the early ‘90s to one of Gen-X’s longest running rockers who has slowly but surely moved into the classic rock tier. “The Last Place That Love Lives” offers another of the more obscure songs from the Crowes’ last album, and it’s clear that Robinson still feels this one on a deep level. It could lead fans to see great potential if the CRB were to tackle some of the rockers from the Crowes’ last two albums that have been sitting on the shelf for years and which still could still shine brightly. Dynamic songs collecting dust such as “Movin’ Down the Line”, “A Train Still Makes a Lonely Sound”, and “Houston Don’t Dream About Me” would seem ripe for further life. Robinson lightens the mood a bit with some amusing anecdotes from the road about late Black Crowes keyboardist Eddie Harsch from the band’s early days, which serves as a prelude to the bluesy lament of the Crowes’ “Good Friday”. A peak moment follows as “Appaloosa” once again shows the staying power of the material from Before the Frost, one of Robinson’s most heartfelt songs that just tingles the soul. A trip back to the band’s prime era in the mid-’90s concludes the set with a rocking rendition of “High Head Blues”. Black Crowes fans will have a chance to double-dip this year as former Crowes Rich Robinson, Marc Ford, and Sven Pipien lead The Magpie Salute on the road for a promising tour of their own, what with guitarists Robinson and Ford being the dynamic six-string duo on the Crowes’ first four albums. The Chris Robinson Brotherhood will meanwhile crisscross the country as usual, averaging some 115 shows per year so far as they continue to carve out a well-earned reputation as one of the hardest working bands in the rock ‘n’ roll business while flying the freak power flag for the psychedelic rock counterculture as few others can or do.